Race takeaway: Running with a stroller is hard work! Sunday Rob and Drew ran the Run Galesburg Run Half Marathon and Chase and I ran the 5K. This would be my first time pushing Chase in her stroller in a race. All of our past races with Chase Rob has done the pushing. It was a very warm morning, 70 degrees and sunny, and it was only 7am. Logistically this is an easy race to get to. The start/finish is the same location and we can part in the lot right next to everything. I forgot to pull Chase’s sunshade up for the picture. At least it provides good coverage! Since it’s a smaller race, there are no start corrals and the half marathon and 5K start together. The 1 mile walk begins just a few minutes after that. Strollers were asked to line up in the back so we took our position at the end. 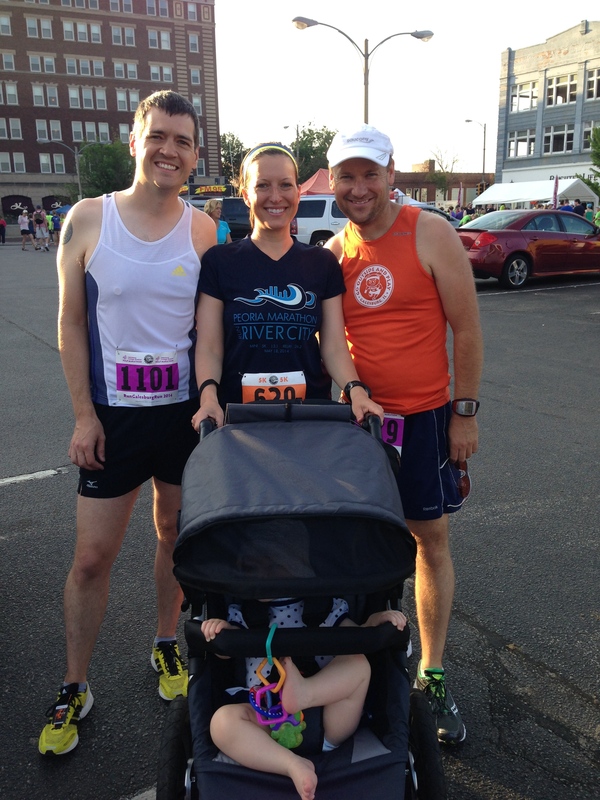 Running with a stroller in any race is a challenge. You have to be very mindful to not to clip a runner with your wheels, especially when some runners don’t run a straight line and make sudden movements or go to a dead stop or walk without moving to the side. Also passing people requires taking the outside edge most of the time. Collectively this makes for a slower time because we easily get stuck in pockets of people that are going a different pace and it requires extra maneuvering. This race only half of the road was marked off for the race so it made for congestion in many spots. Regardless I’m just so happy this race allowed the 5K to have strollers. Afterward we waited around and cheered Daddy in. He finished in 1:50:31. Drew ended up having to help a lady that went down on the course. He and another runner made sure she got water and medical attention. He finished in 2:27:17. Categories: 5K, Race | Permalink. 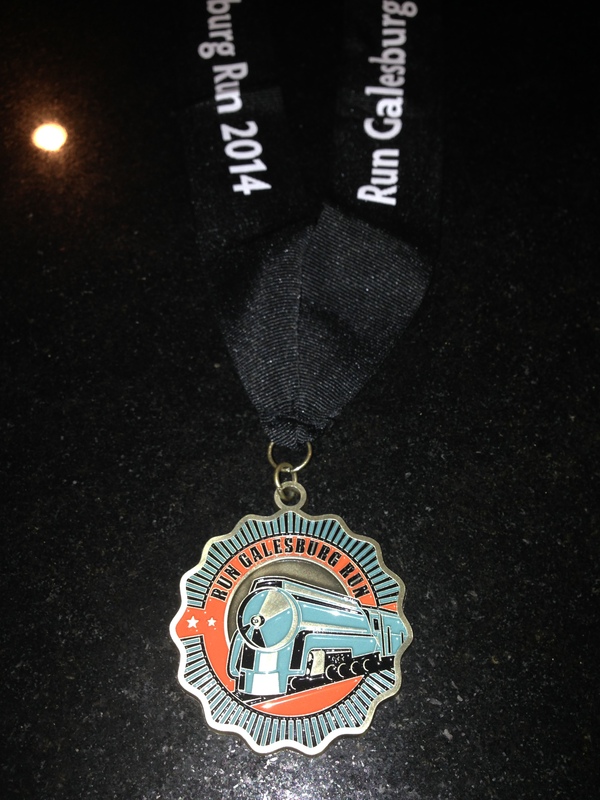 wondering… is the Galesburg race mostly flat? thinking of doing next year. Submitted a reply and I don’t think it attached to this thread. Just wanted you to know my response is on this post. Thanks! Hey Mark, Galesburg is not a flat course. There are hills throughout the course, with a few bigger ones after mile 7. If you are looking for a flat Half Marathon RNR Chicago Half Marathon in July and We Care Twin Cities in Bloomington, IL held in September are both definitely flat. I have posts on both of those races as well. We have the Mountain Buggy Terrain and love it! Starting out attached the Peg Pereggo Carseat adapter for when she was younger and kept to smooth running paths. There are so many options out on the market so definitely check reviews and feature comparison reviews on YouTube. I love all of the features of a hand break, two drink holders, and it rides smooth over everything. I only wish they had a bug cover (mesh) option for additional shade protection. They only have a rain cover option that can be purchased, but we wouldn’t ever run in those conditions with her. So excited for you guys!! 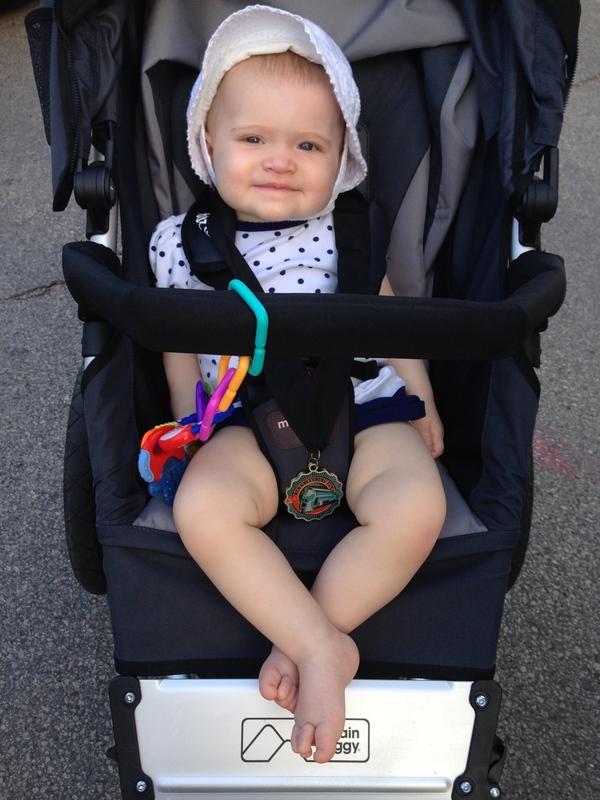 Chase looks super cute in her stroller with her awesome medal! You’ll make a runner out of her yet. Haha I can’t imagine how difficult it must have been to run without upper body movement.